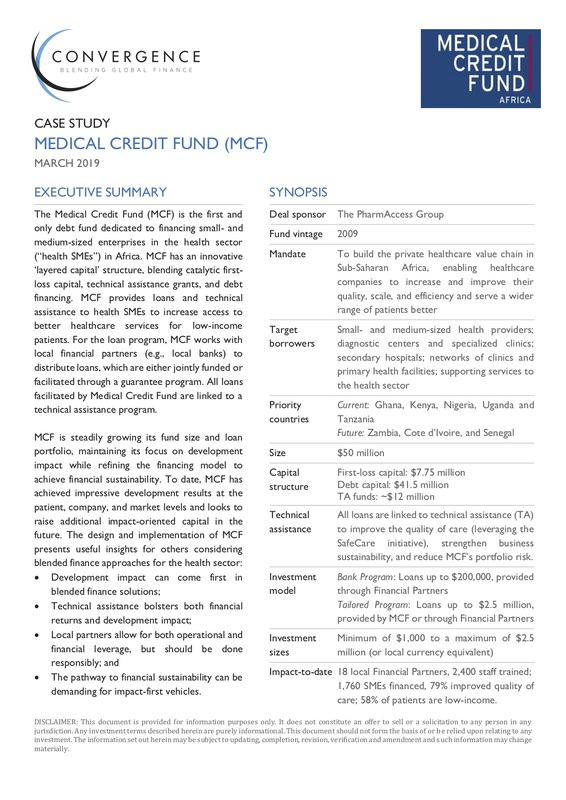 The Medical Credit Fund (MCF) is the first and only debt fund dedicated to financing small- and medium-sized enterprises in the health sector (“health SMEs”) in Africa. MCF has an innovative ‘layered capital’ structure, blending catalytic first- loss capital, technical assistance grants, and debt financing. MCF provides loans and technical assistance to health SMEs to increase access to better healthcare services for low-income patients. For the loan program, MCF works with local financial partners (e. g. , local banks) to distribute loans, which are either jointly funded or facilitated through a guarantee program. All loans facilitated by Medical Credit Fund are linked to a technical assistance program. The pathway to financial sustainability can be demanding for impact-first vehicles.